Sebastian Von Nagel recently finished his latest double Baidarka, ulux^tax^ in Unangam Tunuu. Some pictures follow. Sebastian with three of his skin on frame boats. The framework of the playboat in front was built almost entirely from recycled IKEA furniture. Sebastian's son Julian did the building under his father's tutelage. Just back of Sebastian is the double that he and I built together and all the way in back is Sebastian's latest double creation that is an evolution from the first double and incorporates a number of Sebastian's innovations. 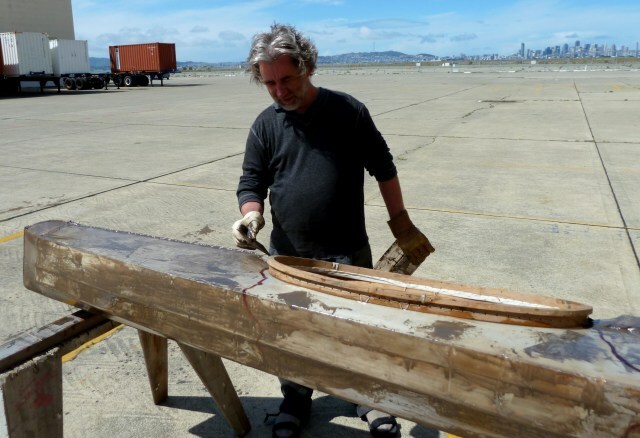 One of Sebastian's innovations was the use of epoxy as a sealer for the hull material. Not that epoxy as a hull material is an innovation in itself, but the use of epoxy on top of a nylon fabric is something of an innovation. I had always avoided epoxy under the assumption that it would be too stiff, but one or two layers on top of a flexible fabric maintains flexibility. Sebastian combined an opaque colorant with the translucent epoxy which makes for an interesting effect when viewed from the inside of the boat. Here's a view of two doubles together. Two things worth pointing out. One is the position and spacing of the cockpits. The other is the upturn of the nose forward of the front cockpit. Here's another view of the latest double. Note both the upturn of the bow and the long fore-deck. Which gets me to the point where theory ends and practice begins. A boat no matter how good in theory needs to perform on the water. Let me enumerate the features and how they impact performance. Perhaps one of the most obvious innovations of the ulux^tax^ is the positioning of the cockpits. The back cockpit is close to the stern and the spacing of the cockpits is far enough apart so the two paddlers can paddle without having their paddles collide. One of the problems with a double where the paddlers are too close together is that both of them have to be synchronized. This is a good idea in theory, but unless the strength of the two paddlers is matched to their paddles, they will most likely be wanting to paddle at different cadences. Placing the back cockpit far back allows the front cockpit to move back as well while at the same time maintaining good separation between them. Having the front cockpit far enough back tends to keep the front paddler drier. The upturn of the bow also keeps the bow from spearing into steep wave fronts. Sebastian and I took his latest double out on SF Bay on a day when the wind was blowing 25 mph and the water was choppy and any water thrown up by the bow would have blown into my face. But thanks to the upturn of the bow, this didn't happen and the ride was remarkably dry. 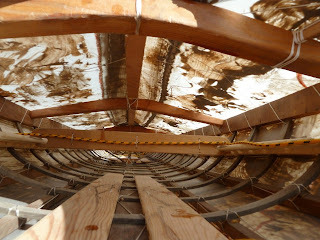 The upturn of the bow also elevates the keel line at the bow so the first two feet or even more of the baidarka are out of the water. While this reduces the length at the water line, it makes it a little easier to turn such a long boat. The far back position of the rear paddler also makes it easier to turn such a long boat. The ulux^tax^ was also well tuned to rough water paddling. The relatively narrow hull sits fairly deeply in the water and when Sebastian and I paddled sideways to the waves, the boat seemed practically indifferent to the waves. There was none of the pitching from side to side that you normally get with a wide, flat bottomed boat in rough water. 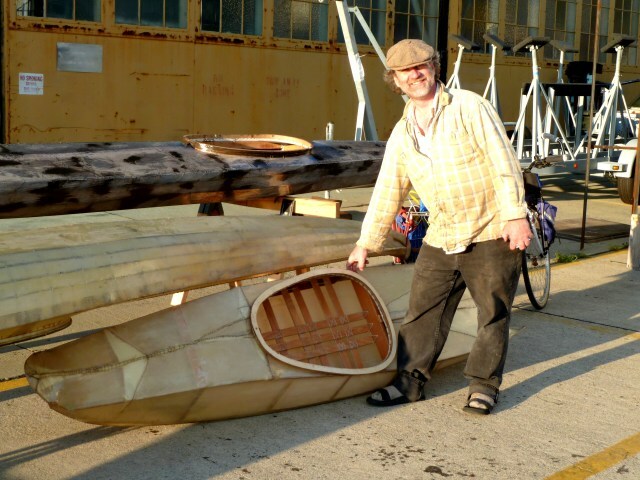 When the ulux^tax^ is pointed into the waves, the two feet of bow that hang in the air on flat water act as reserve buoyancy and get to provide lift without burying into the face of the wave. Anytime you bury the bow of the boat in a wave you lose more momentum than if you don't. Not burying the bow also avoids throwing water into the air which then doesn't get picked up by the wind and thrown into the front paddler's face. One final point. The volume of a kayak also becomes an issue in rough water and strong wind. Any part of the kayak above the water line along with the bodies of the paddlers act like a sail and retard forward progress against the wind. Kayakers need to be able to maintain forward motion or risk being blown into a hostile shoreline. Double kayaks are great for long trips because of their large carrying capacity, but when paddled empty, they can easily have too much sail area which then becomes a liability in a strong wind.